Volkswagen Group's supervisory board criticized a remark made by CEO Herbert Diess that appeared to play on the slogan on the gates of the Auschwitz concentration camp: "Work sets you free." Diess has apologized for saying "EBIT macht Frei" during an internal presentation to managers, explaining that he in no way wanted to draw a comparison to the Nazi-era slogan "Arbeit Macht Frei," which appeared on the gates of Auschwitz during the Holocaust. VW Group's supervisory board said it "strongly distances" itself from the remark, but at the same time "takes note of the immediate apology from Mr. Diess." Diess’s comment "is in this context considered inappropriate," the supervisory board said. Diess said it was a very unfortunate choice of words and "I am deeply sorry for any unintentional pain I may have caused." The expression was made in an internal management presentation in connection with operating margins from various company brands, Diess said. Within Volkswagen, "brands with higher margins have more freedom within the Group to make their own decisions. My comment was made within this context," he said. The remark was all the more unfortunate considering Volkswagen’s history. The automaker was founded by the German government in 1937 to mass-produce a low-priced car, and was originally operated by the German Labour Front, a Nazi organization. Volkswagen, whose factory was repurposed during World War II to build military equipment and vehicles, is today the world’s biggest automotive group with brands including Audi, Bugatti, Porsche, Skoda and Seat. The episode increases the risk of a possible management change at the carmaker, according to Sanford C. Bernstein analysts. "For all his energy and willingness to challenge convention, does he have the judgement and diplomatic skills to carry this huge, political organization with him?" Bernstein analysts led by Max Warburton wrote in a note. "Would the body reject the transplant?" Asked whether Bernstein was right to suggest that Diess had lost support internally as a result of the remarks, the supervisory board said such an inference was inappropriate. "This comparison is nonsense," a spokesman for supervisory board Chairman Hans Dieter Poetsch said on Friday. 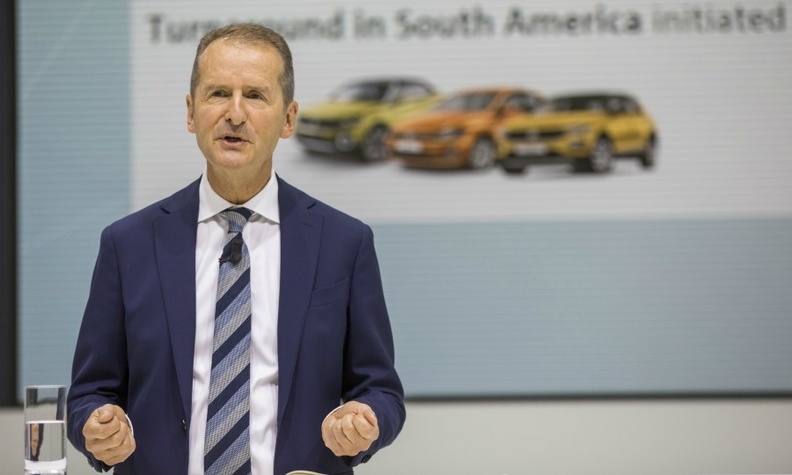 VW’s powerful works council welcomed Diess’s "swift clarification and unequivocal apology” for the remark, adding that remembrance and responsibility are part of the company’s DNA. German government spokesman Steffen Seibert declined to comment. Since Diess, 60, took over as CEO last April, he has struggled to put ist diesel cheating scandal in the past. In the latest twist, the U.S. investors watchdog SEC said Thursday it was suing the automaker for failing to disclose to investors that its diesel vehicles violated emission standards. "The investors did not know that VW was lying to consumers to fool them into buying its ‘clean diesel’ cars and lying to government authorities in order to sell cars in the U.S. that did not comply with U.S. emission standards," the SEC alleged. VW said the SEC complaint is legally and factually flawed and the company will "contest it vigorously."